Mobile Ad Hoc NETworks (MANETs) are gener-ally thought of as infrastructureless and largely “un-managed” network deployments, capable of accommodating highly dynamic network topologies. Yet, while the network infrastructure may be “un-managed”, monitoring the network performance and setting configuration parameters once deployed, remains important in order to ensure proper “tuning” and maintenance of a MANET. This paper describes a management framework for the MANET routing protocol OLSRv2, and its constituent protocol NHDP. It does so by presenting considerations for “what to monitor and manage” in an OLSRv2 network, and how. 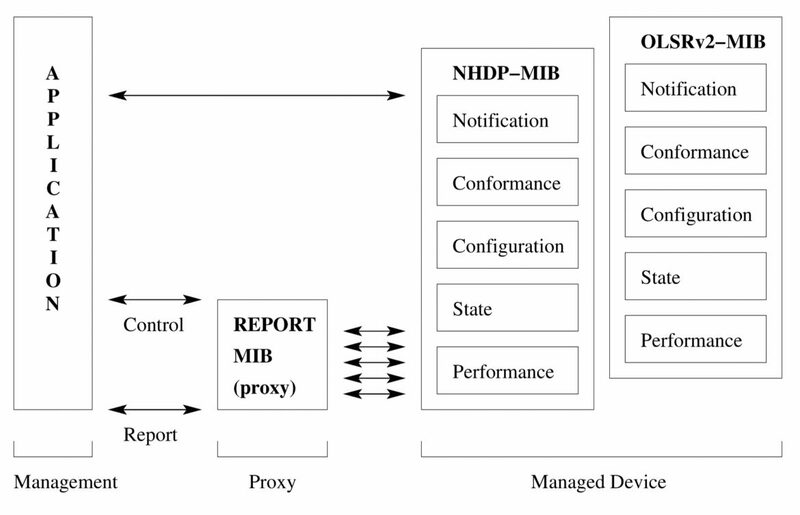 The approach developed is based on the Simple Network Management Protocol (SNMP), and thus this paper details the various Management Information Bases (MIBs) for router status monitoring and control – as well as a novel approach to history-based perfor-mance monitoring. While SNMP may not be optimally designed for MANETs, it is chosen due to it being the predominant protocol for IP network management – and thus, efforts are made in this paper to “adapt” the management tools within the SNMP framework for reasonable behavior also in a MANET environment.